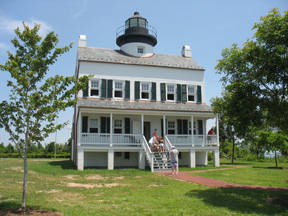 Blackistone Island Lighthouse (Replica)* – Chesapeake Chapter U.S.L.H.S. The original lighthouse was decommissioned in 1932 and stood until July 16, 1956 when it caught fire and was destroyed. It is thought that the fire was caused by a shell from the nearby Naval station. The Navy razed the remains of the abandoned lighthouse. Interest in the lighthouse did not disappear when the remains were removed. 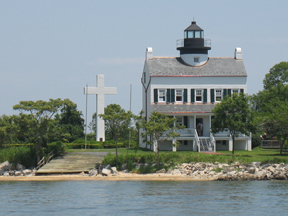 The St. Clement’s Hundred group was formed in the late 1990s and they began working on efforts to rebuild the lighthouse. They used specifications from the original structure along with photos of the original light to help them build an exact replica. Work began on April 2007 and was completed in June 2008. The only thing different about the replica is its location, about 150 yards away from the original site, which has been undermined by erosion. It is now open for tours thru St. Clement’s Island Museum. From Washington, D.C.: Take 495/95 Beltway to Exit 7A (Route 5 south to Waldorf). Follow Route 5 to Waldorf; make a left in Waldorf to continue on Route 5. In Mechanicsville, Route 5 turns right. Continue on Route 5 to Morganza. Turn right on Route 242. Follow to Colton’s Point. Turn left onto Bayview Road and follow Museum signs. From Virginia: Take Route 301 to Route 234 (turn at the White House Hotel). Take Route 234 south to Clements. Turn right onto Route 242 and follow to Colton’s Point. Turn left onto Bayview Road and follow Museum signs.